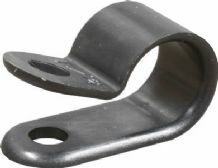 Pack of 10 spring steel clips designed to allow wiring looms to be clipped to chassis rails, body panels etc. 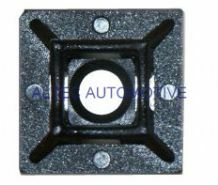 Spring steel clips designed to allow wiring looms to be clipped to chassis rails, body panels etc. 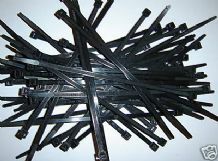 100 x Black cable ties, 100mm in length and 2.5mm in width. 100mm in length and 2.5mm in width. 100 x Black cable ties, 160 mm in length and 4.8mm in width. Highest trade quality. 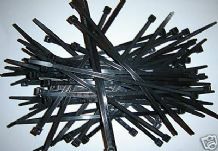 100 x Black cable ties, 200mm in length and 2.5mm in width. 100 x Black cable ties, 200 mm in length and 4.8mm in width. Highest trade quality. 300 mm in length and 4.8mm in width. 370mm in length and 4.8mm in width. BLACK nylon 19 x 19mm self adhesive cable tie bases. 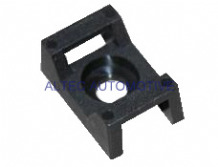 28 x 28mm black self adhesive cable tie bases, suitable for securing automotive wiring, conduit etc. This fixing will accept cable ties up 4.8mm in width. 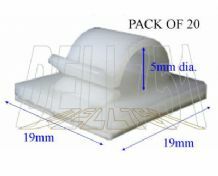 Pack of 20 x 19 x 19mm white NYLON self adhesive cable/loom clips. Pack of 20 x white 25 x 25mm NYLON self adhesive cable/loom clips. 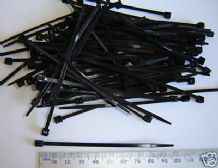 100 pack of 15 x 10 x 7mm, cradle type, black screw down cable tie bases, suitable for securing automotive wiring, conduit etc. This fixing will accept cable ties up 5.00mm in width. 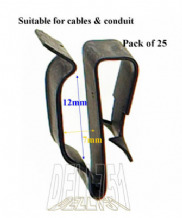 Pack of 25 spring steel clips designed to allow wiring looms/conduit to be clipped to chassis rails, body panels etc.